Hi Peeps,how is everyones day? 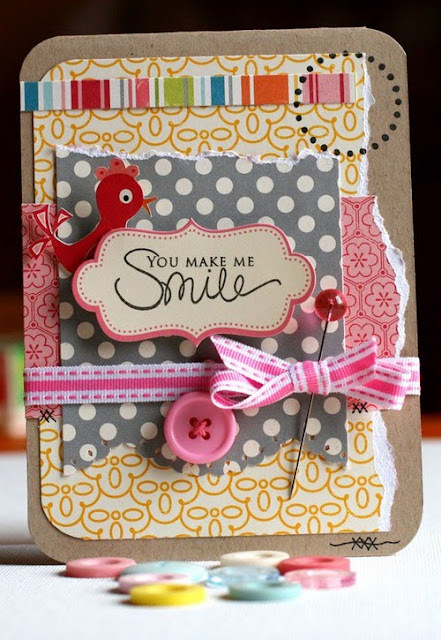 I use October Afternoon Cherry Hill papers and a PapertreyInk stamp "You make me smile"
WOW!! Marinette, this is awesome, what a wonderful card! A very bright and cheerful card! Love October Afternoon papers. Also, your post yesterday regarding your son's birthday was beautiful. Oh my gosh, I LOVE this!! What a gorgeous card, Marinette!! What a fun card, Marinette! 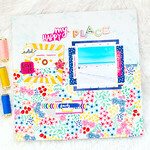 I love all the patterns you used and the torn edges! Perfect sentiment for such a fun card! Love the little birdie! I am glad to hear the sun finally came out where you are. Nice job on the card too. It definitely made me smile! Whaooosssshhhhh!!!!! Je suis MEDUSEE! C'est dément comme elle est belle! Pfiou! Je craque! Je craque! Bravo! Encore!